28. 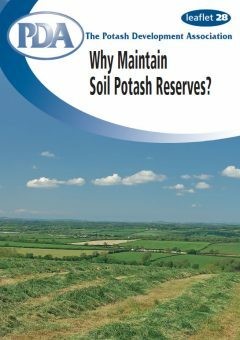 Why maintain soil potash reserves? How much soil potash do I need? Home » Potash Leaflets » 28. Why maintain soil potash reserves? Potash is an essential nutrient for all crops and grassland and for livestock. Maintaining soil fertility so as to produce economically viable yields requires the appropriate use of all inputs including plant nutrients of which one of the most important is potash, K2O (potassium, K). A current danger is reducing potash inputs to save money, but this can be very short sighted. This leaflet outlines current issues related to potash use on arable crops, especially recent very worrying evidence for a decline in the use of potash fertilisers. This declining use will have an adverse effect on soil fertility and on the production of economically viable crop yields of acceptable quality. Crops take up very different amounts of K during growth but all need a readily available supply in the soil at key times in their growth. For potatoes, two-thirds of the season’s requirement is taken up in the six weeks after plant emergence. For winter cereals a small amount is needed for establishment but most is taken up in the short period between tillering and earing. During periods of rapid growth and greatest daily need, crops can take up as much as 10 kg K2O/ha each day from the soil. As crop yields continue to increase as better varieties come on stream and agronomy improves, the total amount of readily available K in the soil must be able to satisfy the demand of the crop. The supply of naturally occurring, plant-available nutrients in the soil plus the amounts recycled through organic manures, mainly farmyard manure and slurry, are usually too small to achieve economically acceptable yields. The yield benefits from using fertilisers have been considerable. For example, in the UK the average annual yield of winter wheat increased from about 2.5 t/ha grain in the 1940s to an annual average of about 8.0 t/ha today. This increase has resulted mostly from an increased use of nitrogen (N) on soils with an adequate supply of K and phosphorus (P). However if K and P are in short supply in the soil, the applied N will be used less efficiently than it should be, resulting in a direct cost to the farmer. During growth, crops need as much K as N – some need more. Effective use of large amounts of nitrogen must be matched by appropriate applications of potash. In recent years, threats to the financial viability of many farm enterprises, due to market prices and enforced set-aside under the Common Agricultural Policy have combined to decrease potash use. Figures for West Europe show a marked decline in potash use in recent years, a decline not mirrored by the use of potash in North America. Farmers in North America still value potash, and could have a competitive edge in future as downward trends here have an adverse effect on yield. Changes in potash use in the UK are similar to Europe, but with a more marked decline in potash use in recent years. This decline in potash use presents a risk to long-term soil fertility because the potash balance (potash applied minus the potash removed in the harvested crop) for all arable crops has been negative since the early 1990s and the deficit is getting greater. Potassium in soil can be thought of as existing in four pools according to the availability of the K for uptake by plant roots. It is present dissolved in the soil water, adsorbed onto particles of clay and organic matter and held within the crystal structure of clay particles. Exchangeable K, which is determined by routine soil analysis, is the K that is most readily available for uptake by roots. It is the K in the soil solution and in the readily available pool. The less readily available K is K that has been retained within soil minerals from previous applications of fertilisers and manures or has been released from native soil minerals by weathering. This pool of K is difficult to measure in the laboratory and is not usually determined for advisory purposes. However, field and glasshouse experiments have shown that the K in this pool is slowly available to crops and is a vital source of potassium. The ‘mineral matrix K‘ is that K in native soil minerals such as feldspars and micas; some soils contain lots of these minerals some very little; the clay content of the soil is not a reliable guide as to the type of mineral. Potassium in the soil minerals is only very slowly released by weathering and the amounts available each year are not sufficient to supply the needs of crop cultivars with a large yield potential. The essential feature of this concept of the behaviour of soil K is its reversible transfer between the exchangeable and less readily available pools. Thus when K is added in fertilisers and manures it goes first into the soil solution, from where it is taken up by plant roots. Some of the K is then adsorbed onto the exchange sites, where it is readily available for release back into the soil solution. From these exchange sites K can move to be within the “silicate layers” that constitute the soil minerals. Here the K becomes part of the less-readily available pool of K. However, when K is in demand by the growing crop this K can be released back into the soil solution for uptake by plant roots. The speed and extent of the transfer of K between these pools and the factors that control the transfer are of special concern, especially if farmers stop applying potash. Little K is lost in drainage from many soils and what is lost does no harm to the environment. Research at Rothamsted through the 1960s and 70s showed that, on many soils, potash reserves which accumulated from applications of fertilisers and organic manures increased crop yields compared to those obtained on similar soils but without such reserves. Also applying fresh K fertiliser to the K-deficient soil, did not increase crop yields to equal those obtained on a soil with an adequate amount of available K. Very recently, this result has been confirmed for sugar beet in experiments at Rothamsted done on behalf of BBRO. The inability of freshly added K to increase yield significantly is because it is almost impossible to thoroughly mix even a large application of potash fertiliser, say 200 kg K2O per hectare, into the cultivated soil layer that can weigh 2 million tonnes per hectare to a depth of 15 cm. On this basis, building up sensible potash reserves and maintaining the readily available pool of soil K at Index 2- is a ‘Win-Win’ scenario. Money spent on potash is not wasted and correct soil potassium levels ensure optimum yields and use of other inputs. However, there is no need to continually build up reserves; other than on very sandy soils it is possible on most UK soils to build up considerable reserves of plant-available K in the soil. On such soils, the yields of crops will follow the Law of Diminishing Returns. That is, as exchangeable K in soil increases then yield will increase rapidly at first and then more slowly until it reaches a maximum beyond which there is no further increase in yield despite further increases in exchangeable K reserves (soil K Index). The K index at which yield approaches closely to the maximum can be considered the critical value. Below the critical value the loss of yield is a financial loss to the farmer. Above the critical value, there is no justification for further increase in the available K because this is an unnecessary expense. Current recommendations for potash on arable soils are to maintain the soil at K Index 2- for most crops and at K Index 2+ for potatoes and vegetables. Thus if the crop rotation on an individual field has a significant proportion of potatoes and vegetables the soil should be maintained around K Index 2+. This is because the potash fertilisation policy should apply to the whole rotation of crops on the farm and it is most important to maintain soil fertility for the rotation. Once the soil has been brought to the appropriate K Index for the rotation it should be maintained by replacing the amount of K removed in the harvested crop. The amount of K removed from a field in the harvested crop can be calculated from the yield and the concentration of K in the crop. The latter can be found in tables published in RB209 or in PDA leaflet ‘Phosphate and Potash Removal by Crops’. These published K concentrations are averages so it may be that a little too much or a little too small an amount will be applied as a maintenance (M) or replacement dressing each year. Consequently, it is sensible to check that potash applications are maintaining the correct level of plant-available K in the soil. This can be done by taking a soil sample every 4 or 5 years from each field for analysis for exchangeable K. Preferably, sampling should always be done at the same point in the rotation, at the same time of year and to the same depth. The British Survey of Fertiliser Practice shows that livestock manures are being applied to about 20% of arable land. Thus it is important when deciding on the size of the maintenance K application to allow for this K as described in RB209. Data from the UK Representative Soil Sampling Scheme showed that 55% of soils growing arable crops were at Index 2-. With about 20% of soils above the critical value and 25% below it, there is clearly a need for more thought to be given to potash use, especially on K-deficient soils. Saving money on potash applications might be appropriate if the soil happens to contain large reserves of K in the less-readily available pool or a large amount of clay that releases potassium. But what are the risks and consequences of getting it wrong? Total use of potash fertilisers in the UK in the 2005/06 growing season was estimated at 325,000 t K2O. Calculations indicate that about 68% of this K was used on arable crops but that the overall application rate of potash on arable land has decreased by about 22% over the last 15 years. In fact, over these last 15 years the actual field rate of potash applied to winter wheat has remained constant at 75 kg K2O/ha, with the overall reduction resulting from the increased number of crops not receiving this annual dressing. It is important to remember that for cereals straw contains more K than does grain, so that if straw is removed from the field large amounts of K will also be removed. However, as mentioned, the overall use of K on cereals has shown a marked decline because of a decrease in the percentage of the crop area that receives K in any one year: 55% of the winter wheat area received K in 2006 compared with 69% in 1998. This decline could be the result of a response to recent grain prices and the need on some farms to improve gross margins. However, if this trend continues and is repeated for other arable crops, levels of readily plant-available K in the soil will decline. Thus it could take 10 years to go from the top of K Index 1 to the top of K Index 0.
effects of soil cultivation and uptake of K from the subsoil by deep-rooted crops like winter wheat and sugar beet. Uptake of K from the subsoil is of particular interest. There is some evidence that crops traditionally considered very responsive to potash are not responding even on soils with a low K Index. For example, no response by sugar beet to K fertiliser has been reported on some soils at low K Indices. This might be caused by past enrichment of subsoils below light textured topsoils to which large amounts of K have been applied. Deep-rooted sugar beet can probably access this subsoil K. In addition to exploiting potash reserves in the subsoil, greater attention to soil cultivation and improved soil structure will allow plant roots to explore a larger volume of soil for nutrient acquisition. Better cultivations and soil structure may well delay the eventual decline in yields as a result of omitting potash, but eventually the ‘crunch point’ will come and however well roots develop and grow in K-impoverished soil there will be too little K available for the crop to achieve its optimum economic yield. This has been demonstrated many times in long-term field experiments at Rothamsted and elsewhere. Trials show that the decline in yield results in a significant loss of profit, even for cereals at low market prices. The optimum index of 2- (120-180 mg K/kg soil) is clearly identified by the shoulder of the blue line. Biggest effects are with those crops that need most potash or have poor root systems which are unable to exploit soil reserves effectively. The decrease in yields with declining exchangeable K in these long-term experiments also emphasise the importance of balanced nutrition – that is maintaining the supply of adequate amounts of all nutrients. Balanced nutrition involving N x P x K interactions needs to be more fully appreciated and responded to by those wishing to achieve optimum economic yields of good quality produce. The yields of sugar shown in the table illustrate such interactions. With too little nitrogen (N), the sugar beet did not fully exploit the soil to find sufficient K to achieve optimum yield; simply adding extra K fertiliser did not solve the problem. The appropriate amount of readily plant-available phosphorus (P) in soil was essential and in this case more important than K. The maximum yield of just over 10 t sugar/ha was achieved with 180 kg N/ha and P or PK. Interactions between N and K are especially important. Many crops contain as much K as N during rapid vegetative growth. Too little K causes ineffective use of N and the potential for N losses to the environment. Experiments with winter wheat at Saxmundham show that, on soils with a low K index (Index 1), first wheats did not respond to more than 120 kg N/ha. Maximum yield only required 160 kg N/ha when the soil was at K Index 2-. There is not much research upon which to base a calculation of the costs of rebuilding potash reserves if they fall below the critical level. Again, the long-term experiments at Rothamsted provide the best basis. Taking into account the movement of potash from‘Readily Available’ into ‘Less Readily Available’ forms during build up, but ignoring crop removals, researchers found that it took 10 kg K2O/ha in excess of crop requirementsto increase the exchangeable soil K by 1 mg/kg. It would therefore require an application of potash in excess of normal crop requirements of approximately 600 kg K2O/ha to move from the middle of Index 1 to Index 2- and 1200 kg K2O/ha to move from the middle of Index 0 to 2-. The cost of buying and applying this amount of potash fertiliser is appreciable. For example, at £140/t for muriate of potash (23p/kg K2O) this comes to £140/ha to move up from Index 1 and £280/ha to move up from Index 0. As can be seen from the Saxmundham data above, the penalty for being in Index 1 compared to Index 2- (when using N rates which are optimised for correct reserves) is 11.15 – 9.12 = 2 t/ha. This currently represents an annual value which is greater than the total cost of returning soil K to the Index 2- target. The practical conclusion to be drawn from these restorative costs is not to allow soil K to fall below target levels and this is further endorsed by consideration of the crop value penalties involved. However, it is not recommended to restore low soil K with such large quantities in a single year. Besides the cost of buying and applying such large amounts of potash fertiliser there is a risk that unless the fertiliser is applied at the right time and is very well mixed into the cultivated soil there could be a serious risk of ‘salt’ damage to germinating seedlings. If the exchangeable K is below the desired value then it is preferable to apply each year a little more K than the maintenance or replacement dressing. The current guidelines (Defra RB209, 7th edition) recommend 30 kg/ha potash in excess of replacement per year at K Index 1 and 60 kg/ha at K Index 0 and thus aim to restore reserves which have been run down over a longer period. The cost of 25 kg/ha of potash is less than £6 and clearly is an input that should not be sacrificed under any circumstances. Maintain soil K at Index 2- for most arable crops, but at K Index 2+ for potatoes and vegetables. Allowing soil K levels to fall below this is a false economy. Insufficient potash costs money in lost yield and probably wastes money in lost N and extra pesticide use.